Symphonie Nr. 1 C-dur op. (Study Score) Miniature Full Score. Look Inside Londoner Symphony, No. Composed by Malcolm Binney (1944-). Journeysongs 3 Composed by Various. Piano Composed by Magnus Lindberg. Composed by Lasse Thoresen. Score. 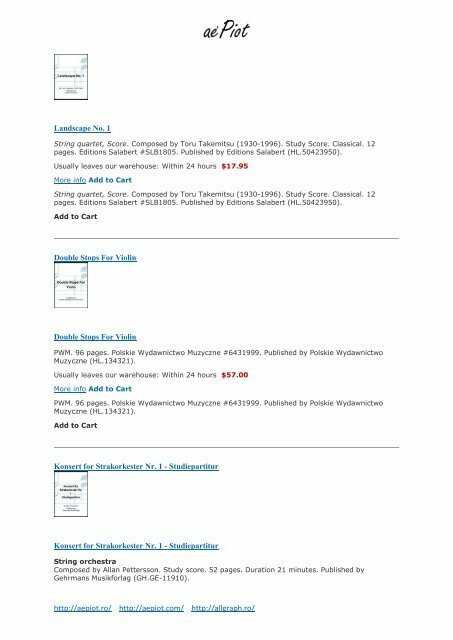 Add to Cart La Clemenza di Tito, K.
(Score) Composed by K. Szymanowski. Page 1151 and 1152: Classical, Contemporary. 24 pages. Page 1169 and 1170: Piano Trio Violin, Cello and Piano. thanks. Score. ZWV 145. 128 pages. Concert band Composed by Claude T.
Accent II: The Legacy of Claude T.
Trios Vol. 3 Look Inside Trios Vol. SATB choir Composed by Allen Pote. Choral (2-Part) Discovery Level 1. Piano Sonata No. 15 in D Major, Op. Time 21 B. Oramos cantando series. Vocal The Vocal Library High Voice.